In the nearly 4 ½-hour elaborately produced show, Putin addressed a wide range of questions, largely domestic concerns such as road conditions, health care and village schools. In this file photo, Russian President Vladimir Putin gestures answers a question during his annual call-in show in Moscow, Russia, Thursday, June 7, 2018. Putin hosts call-in shows every year, which typically provide a platform for ordinary Russians to appeal to the president on issues ranging from foreign policy to housing and utilities. Russian troops will remain in Syria as long as Moscow thinks it's necessary, but Russia isn't building permanent facilities in the only Middle East country where it has a military foothold, President Vladimir Putin said Thursday in his annual marathon call-in show. The troops "will stay there for as long as it is to Russia's advantage, and to fulfill our international responsibilities," the Russian leader said during his annual televised call-in show. But, he added, "we are not building long-term installations there and if necessary can withdraw our servicemen quite quickly without any material losses." Putin didn't elaborate under what circumstances Russia could leave or on Moscow's broader strategy for Syria. Russia uses leased facilities for ships at Tartus and for an air base in Hemeimeem. On international questions, he said he believes other countries wrongly regard Russia as a threat and that mistaken concept can end if they see that the economic sanctions the West has put on Russia don't serve their interests. Russia has been hit with sanctions by the U.S. and the West over its 2014 annexation of Crimea, its support for separatist rebels in Ukraine's east and its alleged interference in the U.S. 2016 presidential election. Britain has also blamed Russia for the nerve agent poisoning in the U.K. of a Russian former spy and his daughter, which Moscow denies. Both the West and Russia have expelled more than 150 diplomats on each side over that issue. "This pressure will end when our partners become convinced that the methods used by them are ineffective, counterproductive and harmful to all," Putin said Thursday. "They see Russia as a threat. They see that Russia has become a competitor to them ... we propose that this is a very mistaken policy." 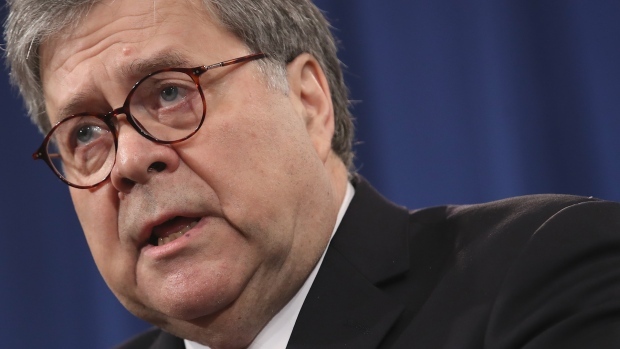 He reiterated his dismissal of allegations that Russia meddled in the election that brought Donald Trump into the White House. Asked what the best joke he had heard recently, Putin cited what he said was commentary in a German publication that Trump "is pushing Europe right into Putin's hands. If we combine it with an earlier joke — that Russia influenced the U.S. election — all that sounds quite funny." The annual call-in show, like Putin's marathon news conference each winter, is a theatrical demonstration of Putin's stamina, reinforcing his dominance of Russia's politics. About 2.5 million messages were reportedly sent to Putin, who answered 79 questions — plus four others that he fielded from foreign journalists after the show. This was Putin's first show since being inaugurated for a new six-year term last month, in which he promised extensive efforts to get Russia's economy to grow into one of the world's top five. On Thursday, he said Russia's gross domestic product is currently 1.5 percent higher than a year ago. He described it as modest but said he's confident that future "growth is guaranteed." 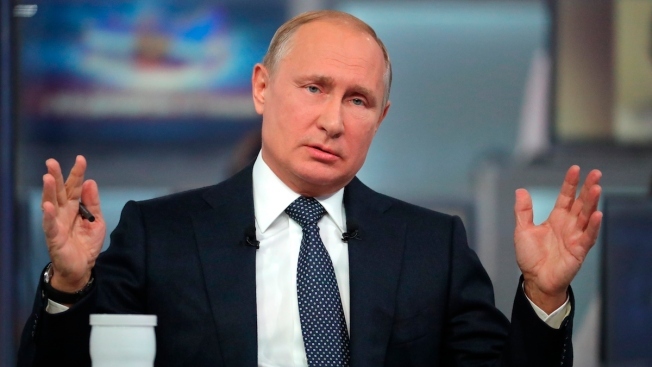 Putin also said the Russian government will be looking to streamline the tax system in order to fight poverty, but denied speculation that Russia was considering abandoning its flat-rate income tax. Amid concerns about Russia's blocking of an encrypted messaging app, Putin pledged to respect internet freedom. Nearly two months ago, authorities began blocking the Russia-developed Telegram app over its refusal to share encryption data with intelligence agencies. That resulted in temporary blockage of some other websites. Asked whether Russia was considering blocking other popular apps or websites, Putin said authorities "are not going to shut down anything." And with the World Cup set to begin next week in Russia, Putin said the event's 12 stadiums must be financially self-sustaining after the tournament, following calls from some officials for government subsidies. He suggested the stadiums could add cafes and shopping malls to boost their profitability once the competition is over. Barring changes in the constitution, Putin wouldn't be able to run again when his current term as president expires in 2024. He has shown no obvious signs of grooming a successor. Asked during the show about who could follow him in the Kremlin, Putin said he is "always thinking about it."